Birth of a baby with down syndrome is a period of anxiety and breakdown to family members and most to the parents. It takes a while for them to accept the fact. Doctors role here, specially pediatrician becomes very important. Genetic counseling with optimal carefulness should be carried out. But with positive hopes and inspirations, these babies are wonderful gift of god. What parents need is a mental preparedness to bring up the child and information to improve the child life quality. Various Questions may arise in the mind of family members? 1. Why did this happen? There is no answer to this. But it happened by chance. Various risk factors are known like maternal age>35 yrs but mother cannot be blamed for this. And age is not sole factor as even mother of 20s can have a baby with down syndrome. 2. What is down syndrome like- Read details – chromosocal disorder of autosomes 21. 3. Will the child be able to live a normal life? The child will be different from other normal people and will be dependent on support of caretakers to at least some degree. You should be prepared for it. 4. Where can we find support group? Every country has a Down Syndrome support society where you can get information, support, rehabilitation for your child. 5. Is there any government policy for helping such children? Depends on your country. 6. What is the natural course of this syndrome? Will he survive and how long? The child will have a short life span but still can live upto 40s. They are more susceptible to have complications. Chance of Alzheimer like disease is high, along with Leukemias. Cervical spine dislocation can cause death. 8. How can it be prevented or detected early? Prenatal diagnosis is possible. Discuss with your Pediatrician and Obstretician. Antenatal hormone study, Ultrasonography and some invasive procedures can confirm diagnosis in utero. 9. Any people who had such syndrome? It is commonest chromosomal disorder and is compatible with life. Visit Support society, you’ll find similar children. Share your experience with their parents. 10 Can my child reproduce? 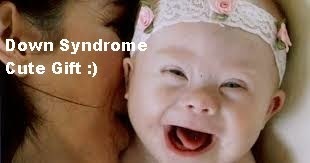 Female with down syndrome are known to be fertile but carry 50% risk to the baby having the same. Counselling may be difficult if the diagnosis was not known prenatally, but with time the parents will accept the fact and even love their child. On External appearance, an experienced Doctor can say it on the spot. The facial features, the slanted eyes with epicanthal fold, foreshortened occiput, flat nasal bridge. If you search in hands, Simian crease ( Single tranverse palmar crease) and short incurving little finger ( Clinodactyly) can be seen. The baby looks cutie in overall still will not look normal. How would you Confirm its Down? Physical features may not confirm the diagnosis, until Chromosomal diagnosis is made, the baby is said to be DOWN PHENOTYPE. Genotyping is done with Karyotyping. Karyotyping is necessary not just for diagnosis but also to see the mode of inheritance- Translocation or non-dysjunction ( Failure of chromosomes to separate ). Do parents need screening Karyotyping? If the baby has translocation, both parents need screening.